Grasscloth – Pricey or Affordable? Grasscloth is a really popular choice for wallcovering right now. Someone asked me the other day if grasscloth is expensive. Well, that depends. 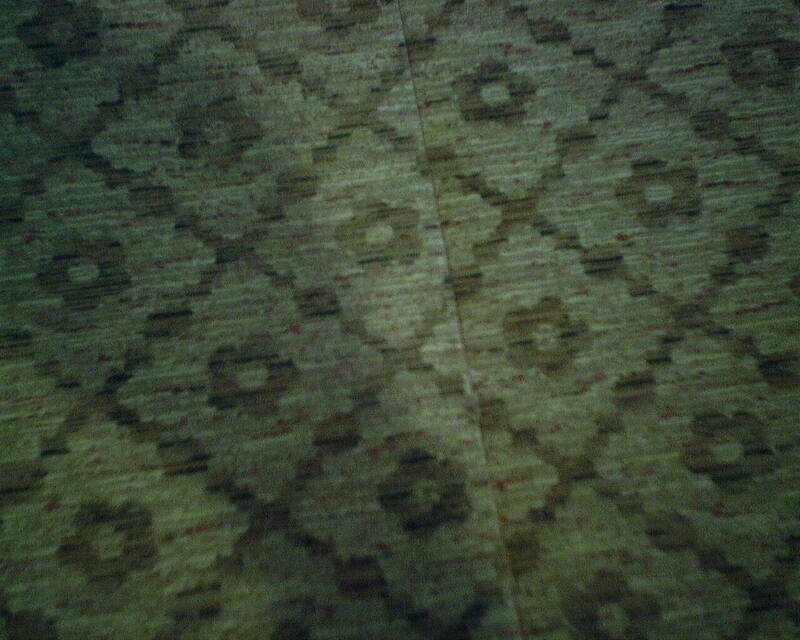 Some years back, I used to be amazed at how cheap grasscloth was, especially considering how “exotic” it looks, and that most of it is imported from Asia. It was cheaper than lots of regular wallpapers. But with the recent jump in interest in textured wallcoverings, many new manufacturers are producing grasscloth. And many designers are quick to put their name on these materials, too. Once you involve a high-end manufacturer, you see the price go up. And add a big-name designer, and the price will really jump. But the thing is, she couldn’t . Yes, there are plenty of somewhat similar grasscloth products, and they were much less expensive. But there was nothing at all that had the same look as the gorgeous denim-look grass she had fallen in love with. She opted to not settle for second choice, but went with what she loved. Other people might be just as happy with a similar but less pricey alternative. With grasscloth, there are lots and lots of options! This faux finish pattern had no real direction, so the eye didn’t notice if it hung right-side-up, upside-down, or sideways. This kitchen had lots of horizontal spaces, all shorter than the width of the wallpaper. So I was able to “railroad” the paper – run it laterally – on the long horizontal runs. 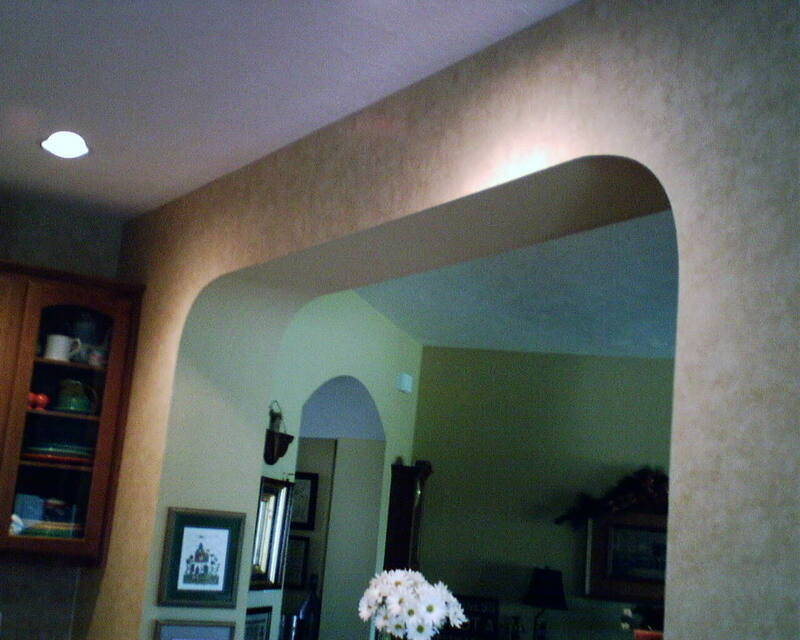 This provides a nice straight line at the ceiling, and, most important, eliminates seams. 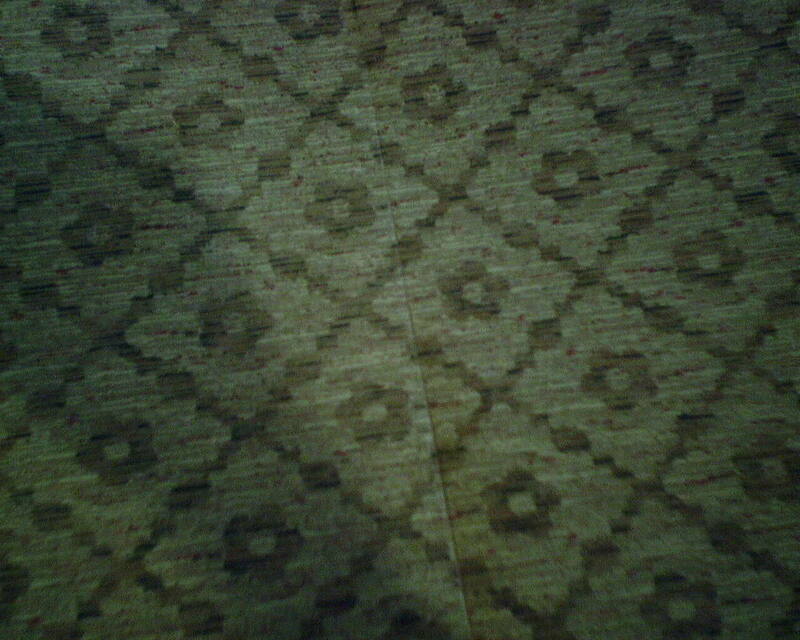 With a strip run horizontally intersecting with a strip run vertically, it’s impossible to match the pattern. So, to minimize the pattern mis-match, I overlapped the pieces and did a double cut (splice), using a curved line, rather than a straight cut, to disguise the seam. 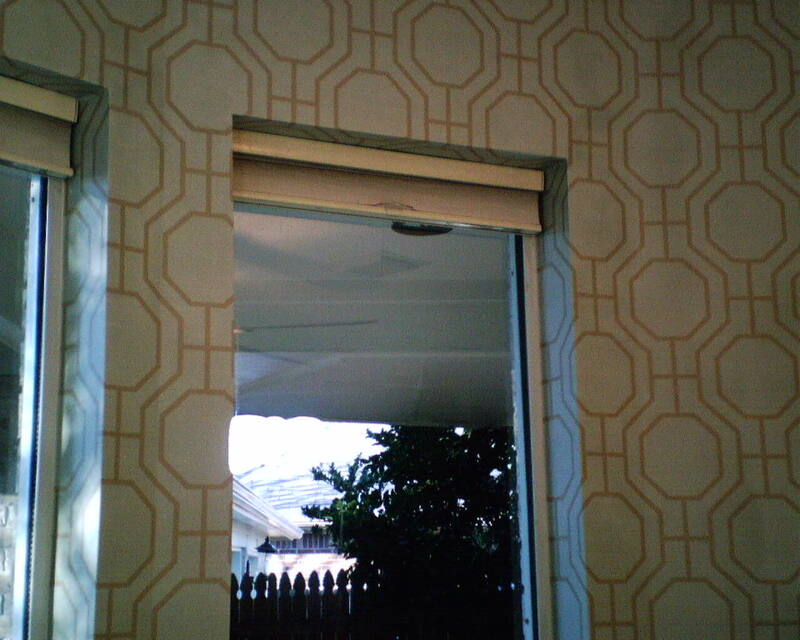 Yesterday I blogged about a wallpaper project Candice Olson was doing for an HGTV show. The job was in a large city, in a mid- or high-rise building, with no elevator. I’m sure that many contractors scramble and fight to win the opportunity to be on HGTV. * Well, I just had to laugh as the show went along. One of the contractors was NOT happy about working in the walk-up mid-rise building – and for the very same reasons that I will hardly ever work in that type of setting. Parking faaaar away. Lugging heavy and awkward tools and supplies up many, many flights of stairs. Restricted working hours limiting how much work you can accomplish in a day. Rules about noise and odors. Persnickety door men and building supervisors. I’ve learned to pass those types of jobs on to buddies of mine who don’t mind the hassles. Unfortunately for the contractors on today’s HGTV program, he had probably signed a contract and was stuck with all the difficulties that came with working in that building. I hope it worked out for him, in the end, that lots of people saw his company name and hired him to do thier remodel jobs. Hopefully in GROUND LEVEL homes! On HGTV today, interior designer Candice Olson http://www.candiceolson.com/ and http://www.hgtv.com/candice-olson/bio/index.html had a wall papered with a nice geometric pattern, very trendy right now, and it certainly enhanced the room’s look. 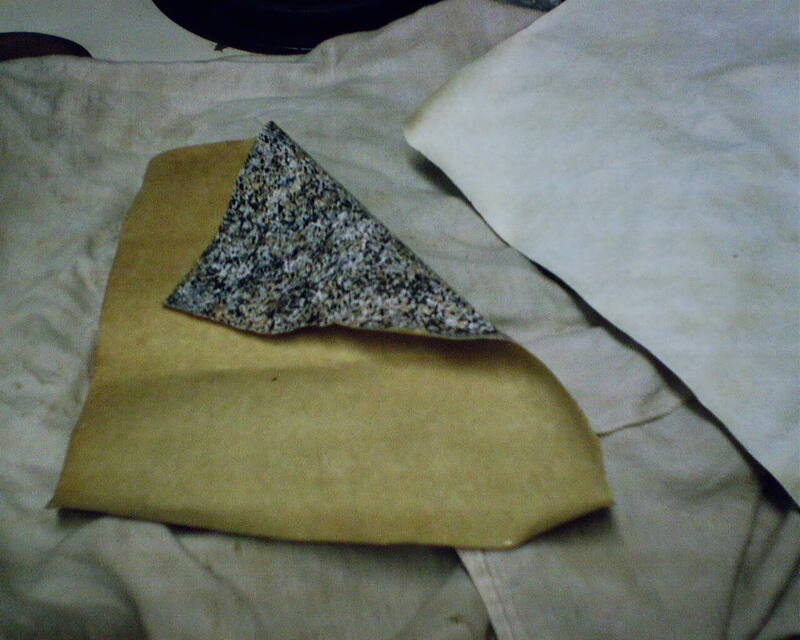 However, she wanted a certain look from the textured paper. I mean, the whole point of using a textured pattern was to get the LOOK and FEEL of the texture. But, even though the pattern was raised above the background, on the wall the paper looked flat. So Candice realized that what was needed to bring out the textured effect was proper lighting. This means lighting not from the front, but from the side, so the raised areas of the wallpaper would cast shadows. She brought in some lighting, mighty snazzy fixtures, to be sure, and got the look she was after. What you are looking at is a scrap of solid vinyl wallpaper with its yellowy paper backing (left), and with the backing removed (right). Workmen got paint on the walls of this client’s bath. She has convinced herself that replacing the two damaged strips is the best avenue; for several reasons, I would rather not strip off the existing paper and replace them … Color difference between what’s been on the wall for 12 years and what’s been in storage, using virtually all the paper she has left, when there may be a greater need down the road, it’s really tricky to remove one strip without damaging the one next to it, and it’s equally tricky to get a new wet strip to mesh perfectly with an existing dry strip (wallpaper is meant to be hung sequentially all at the same time), not to mention lugging my big work table up three narrow flights of stairs. So I want to try patching over the paint stains. On a paper with a pattern, depending on the pattern, you can cut around a vine, for instance, and simply paste it over the corresponding pattern on the wall. This paper has no pattern, so it’s a little more difficult to make the patch disappear. Additionally, since the paper is a paper-backed solid vinyl, there is the issue of the patch being thick and showing by sticking up above the existing paper. Besides the thickness, there is the white color of the paper backing being visible around the circumference of the patch. So I took some scraps home and played. 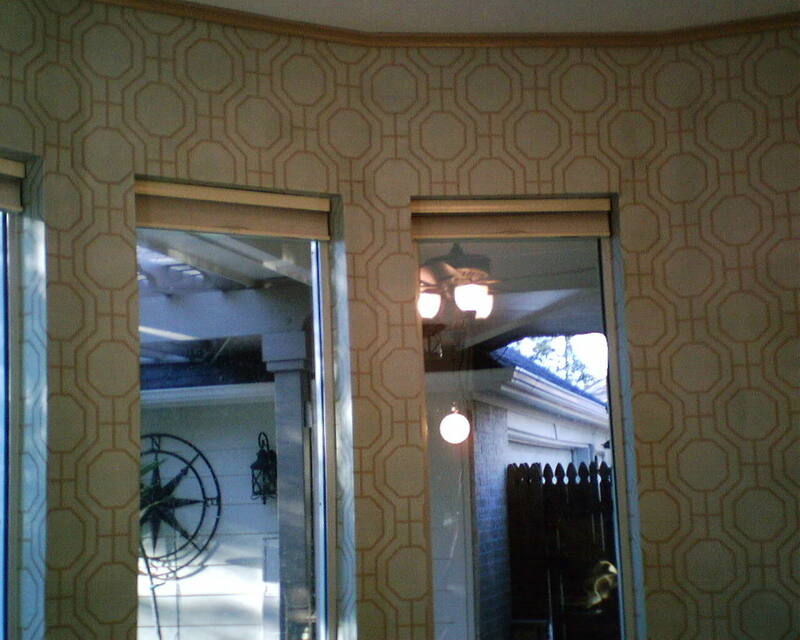 This type of wallpaper is a strong sheet of vinyl bonded to a somewhat fuzzy manilla paper type of backing, something like thin construction paper. I thought that if I could get the vinyl to seperate from the backing, I would have thin enough piece to use as a patch. When you strip this type of paper from a wall, usually the vinyl coating comes off in largish pieces, and leaves the backing on the wall (which then needs to be soaked off). That encouraged me to think I could seperate the vinyl from the backing. I soaked the scraps for two days, to get the backing really saturated and loose. I was able to peel some bits of paper away, but there was still most of it left bonded to the vinyl. Then I used various scrubbies to remove the paper. The green scrubby attached to a kitchen sponge got too gummed up, but I had success with a good old fashioned kitchen pot scrubber – the kind that looks like enlarged nylon net. It took a lot of gentle scrubbing, but I was able to get virtually all the fuzzy paper off. Now the remaining vinyl is thin, and should make a nice flat, invisible patch. With the paper backing gone, I am left with a sheet of vinyl, which doesn’t stick to ordinary wallpaper paste (too slick). So, I will have to use “vinyl-over-vinyl” paste, made to stick to both the exposed vinyl backing of the patch as well as the vinyl coating of the paper on the wall. I have great hopes for this, and am sure it will work well and look better than removing and replacing two 9′ strips. I hope the client likes it, too… as I mentioned, she is pretty set on having the two strips replaced. In her mind, what she sees is nice, clean wallpaper replacing the damaged strips. In my mind, I see a seam that quite possibly won’t be flat and perfect, if I am forced to remove the stained strips and put new wet paper next to the existing dry paper. Let’s hope the patch looks super, and changes her mind. 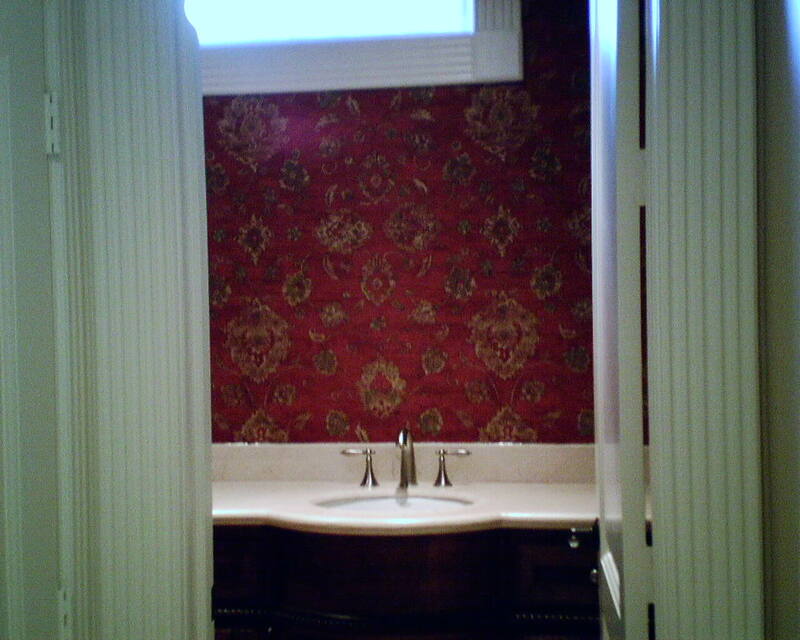 Yesterday I showed the Thibaut diamond pattern that went on the ceiling of this powder room. Here is the finished room – minus the mirror and other decorative items. I couldn’t get far back enough to include the ceiling, but it all works great together. The homeowner was delighted, and said she got the “jewel box” look she was wanting. Can You Spot the Pattern Match? In the first photo, the pattern is incorrectly matched. In the second photo, it’s matched as it should be. At first glance, you would think that every diamond on the left matches every diamond on the right. Not so! There is a subtle difference between a given diamond and the diamond below it. This means that every OTHER diamond will be the pattern match, not every diamond. In this case, and especially since the paper was going on the ceiling, the eye would probably not catch a mis-match. But I still made it a point to match it correctly – sometimes even a slight mis-match will cause a noticeable visual break at every seam. One more thing about this pattern… Because it’s so “scratchy,” it’s one of those nice patterns that doesn’t really HAVE to match perfectly. This enables the paperhanger to maneuver the pattern a little… For instance, your eye would want to see the same flower, for example, at the top of the wall. If the ceiling line is crooked, the flower might start to drop down the wall. But with a “scratchy” pattern like this, it’s possible to mis-match it a little, to work the flower back up to where it is at the top of the wall. 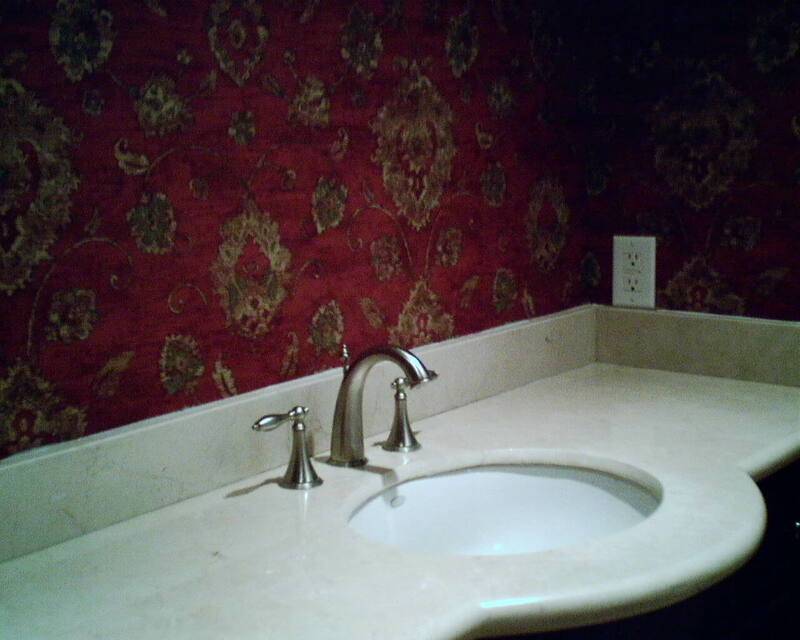 This is a Thibaut wallpaper pattern, and went on the ceiling of a large powder room. Tomorrow I’ll post a photo of the sidewall paper. Home Depot Tags on Wallpaper Bought Somewhere Else? 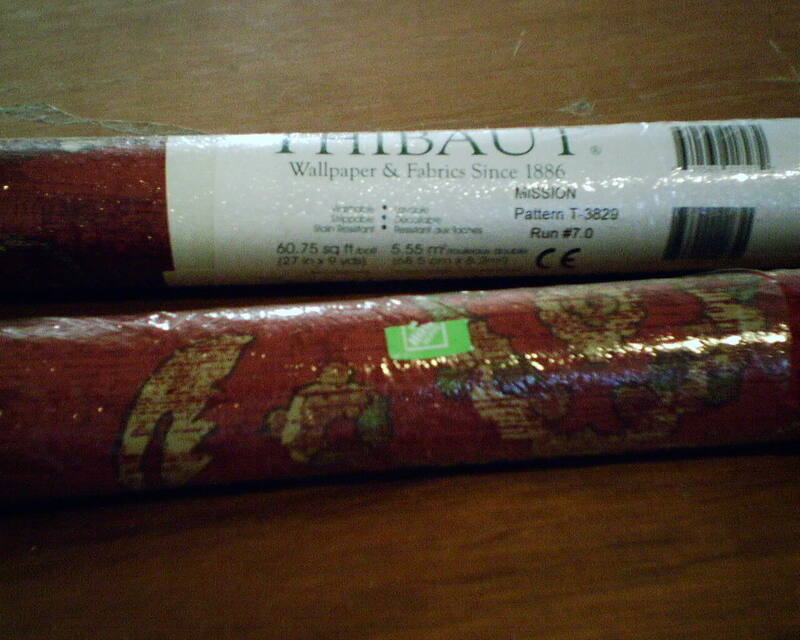 This Thibaut wallpaper was bought from Dorota at Southwestern Paint, my favorite person/place for people to buy their paper. So I was mighty surprised when I saw the green sticker that said “Home Depot” on several of the bolts. Thibaut is a nice brand, and although you could probaby special-order it from Home Depot, now that they are selling wallpaper in some stores again, and if they carry such a somewhat higher-end brand, it’s not likely that they would have bolts of this product on the shelves in their stores. You can never count on walls and windows and doors being plumb or level, and even slight variances of as little as 1/4″ can be noticeable when working with a pattern like this. Keeping a geometric trellis pattern straight along the ceiling and the floor is hard enough, but toss in seven – yes, SEVEN – untrimmed windows with returns that need to be wrapped, none of which are the same width at the top as at the bottom, and it can make for a devilishly long day. 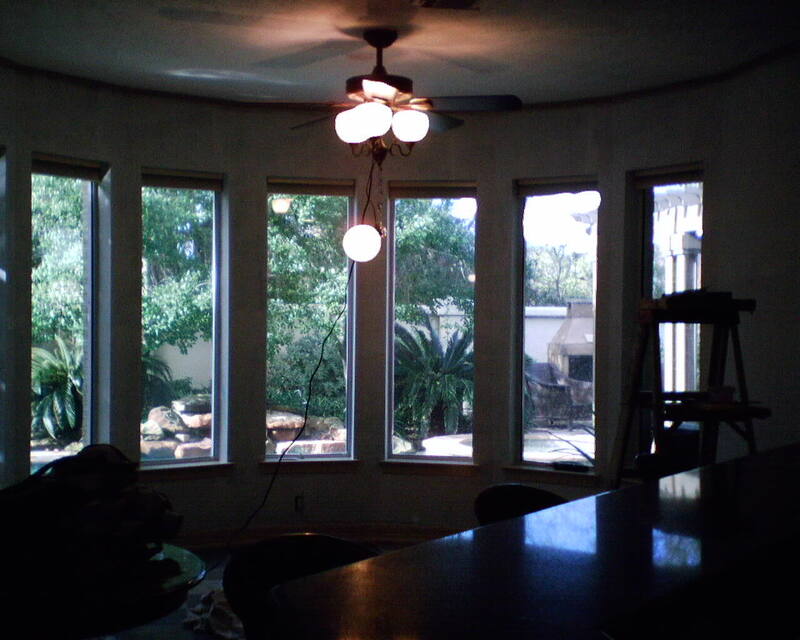 I hung the rest of this kitchen yesterday, and spent an entire 10 hours today on just this one Wall of Windows. My patience and perservence were worth it – in most places, the pattern straight on the wall, and where it didn’t, it was not noticeable. At the end of those 10 hours, the room looked great, and the clients loved it. Incidentally, this is the third time I’ve hung this wallpaper in less than a year. The other two times it was a black-on-off white colorway. People are really loving the geometrics coming out these days. Grasscloth, a very popular wallpaper choice right now, is lightweight stuff, but bulky. Bolts are 3′ long and about 5″ in diameter. The backing is somewhat “puffy,” and the real grass fibers imbedded in the product add lots of thickness. 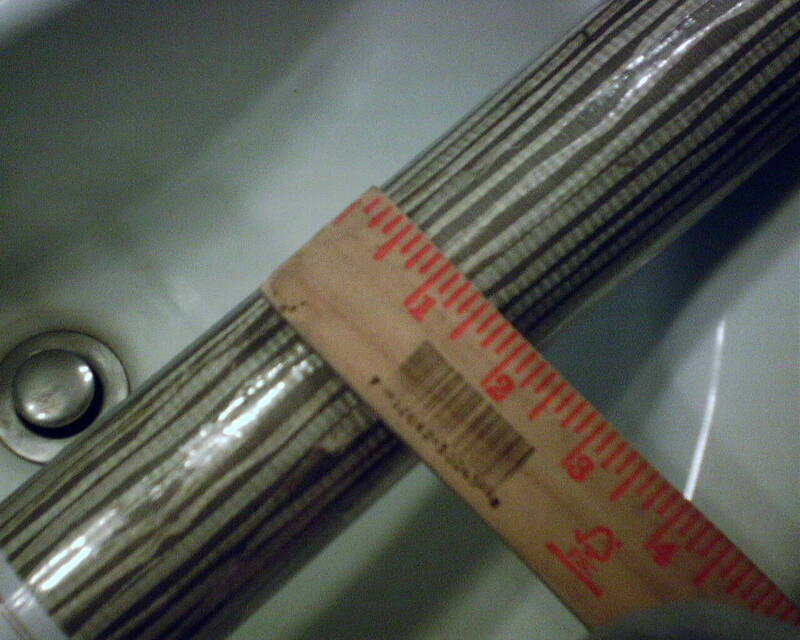 I freaked when I saw this 2″ diameter roll of grasscloth – I thought they had sent us single rolls. which would mean we would have half the amount needed. So I unrolled and measured – sure enough, it’s the proper 24′ long. Whew! It’s the thinnest grasscloth I’ve ever worked with. I was worried that the backing might oversaturate with paste, and delaminate from the surface, but the material is tough and holds up well during installation. And it’s thin enough to turn corners well, which not all grass does. I’m finding that I like it a lot. I’ll finish the room tomorrow, and hopefully will have photos. So far, the homeowner LOVES it! You are currently browsing the Wallpaperlady's Blog blog archives for January, 2013.